Often when our patients lose their back teeth, they opt to replace them using a removable partial denture. We also have patients who don't replace their back teeth at all, assuming that since they don't show when smiling, back teeth don't need to be replaced. At Arizona Institute for Periodontics & Dental Implants, we know that if back teeth are not replaced, your bite and how upper and lower teeth fit together, will be compromised. Changing your bite may result in headaches, teeth grinding, and other problems associated with TMJ disorder. 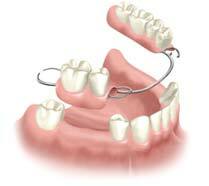 These problems also occur when a removable partial no longer fits properly due to bone resorption, or deterioration. Do partials damage the surrounding teeth? Removable partials are known to actually accelerate the bone resorption process and this results in rapid bone deterioration. Additionally, the clasps that hold partials in place cause extreme pressure on the natural teeth that they hook onto, frequently resulting in loosening them and eventually leading to the loss of those teeth. Most patients with partial dentures state that they are uncomfortable and that they rarely wear them. esthetics similar to natural teeth. What effects will I have due to missing teeth? As your bite collapses due to the loss of bone, your facial appearance will begin to change. You will notice visible aging in the lower half of your face as your cheeks sink inward creating increased wrinkles around your mouth. Additionally, in order to accommodate chewing, the remaining teeth will shift out of place, moving toward the space left by missing teeth, and the front teeth will begin to flare out. However, all of these problems can be eliminated if missing back teeth are replaced. Leslie I. Davis, BDS, DDS, PC can help. 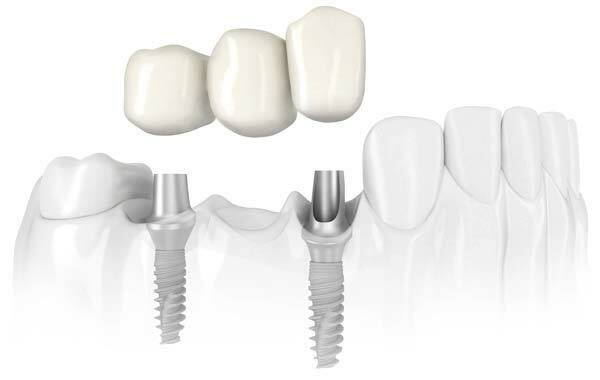 Dr. Davis recommends dental implants to replace missing teeth. Dental implants will preserve bone and implant-supported replacement teeth will restore a proper bite (the way the upper and lower teeth come together). Surrounding teeth will not have space to shift out of place, which means that the appearance of the smile will stay intact. Replacing back teeth with dental implants will also give the facial skin underlying structure for a more youthful appearance. • The appearance, feel and function of your natural teeth. • They are more comfortable and stable than partial dentures. • Your natural biting and chewing capacity is restored. • They virtually stop the bone resorption process (deterioration). • The integrity of the facial structures is maintained. • Your adjacent natural teeth are not damaged or compromised. • You will have a more youthful appearance restored. If you are interested in replacing your partial denture, you can learn more about your treatment options by attending one of the free dental implant seminars offered by Arizona Institute for Periodontics & Dental Implants. Sign up for a free seminar at our Sun City West, AZ location or call (623) 584-0664 for the next seminar in your area, for more information, or to schedule a no-obligation consultation with a specialist in periodontics and dental implants.